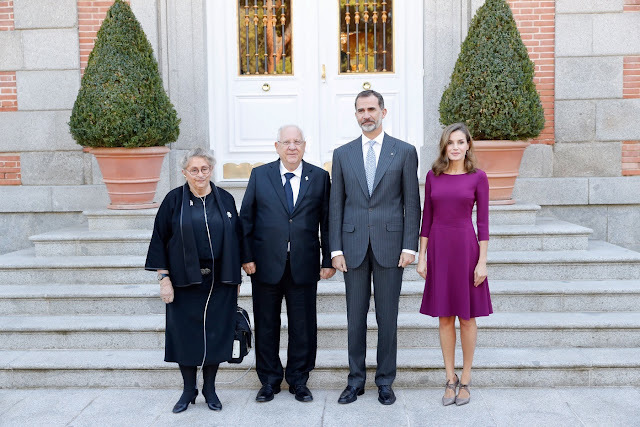 The King and Queen of Spain welcomed the President and First Lady of Israel for a state visit on Monday, including a state banquet at the Royal Palace. This black and white Manila shawl skirt by Lorenzo Caprile is from 2004 and she's worn it with a couple different white tops (this one and this one) and with this black top in the past. The skirt's a treat indeed, even if this might be my least favorite combo of the options to date. 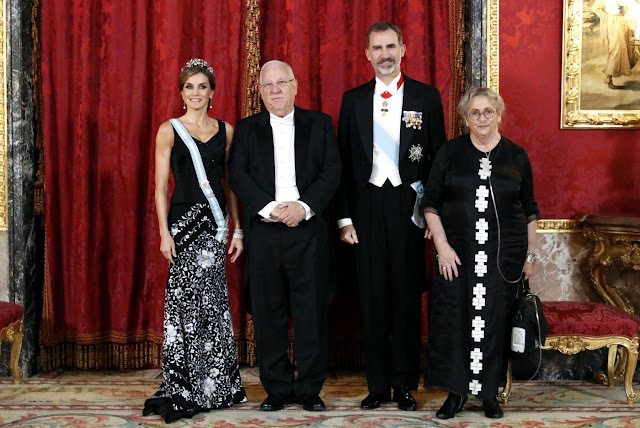 I suppose you could say her return to her usual favorite tiara, the Spanish Floral Tiara, qualifies as keeping her jewelry on the quieter side for the evening. That's just what the comedown from two La Buena appearances in a year will do to ya, though, because this queen's still wearing a tiara, the double bracelets from the joyas de pasar, two diamond brooches to pin her sash in place, and earrings. That's a whole lotta diamonds and the floral tiara's a great choice for this skirt. Fabulous. On the other hand, I did find Queen Letizia's outfit for the arrival to be a bit on the quieter side for a state visit, just this simple dress that was mostly covered by a trench coat. Simple but very purple, so I think you know where I fall on the judgment scale.